In our last section we discussed about categories. In categories we have seen Roles. You me been wondering what it takes to define your own roles. 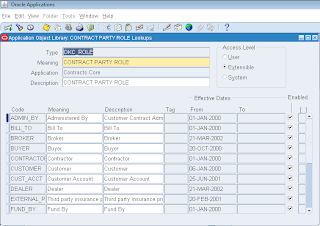 Oracle Service Contracts provides party roles such as Vendor , Customer, Third party etc. 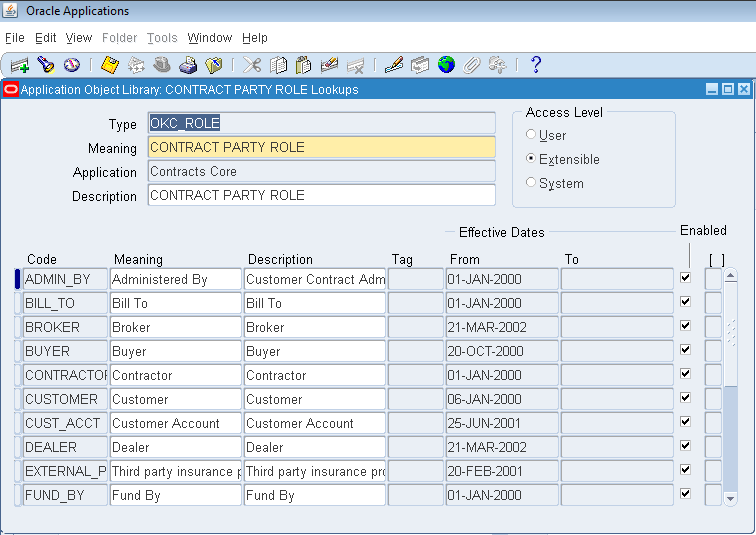 Party roles works at Service Contracts header level, they generally represent an entity that owns the contract. You can define your own business specific roles. 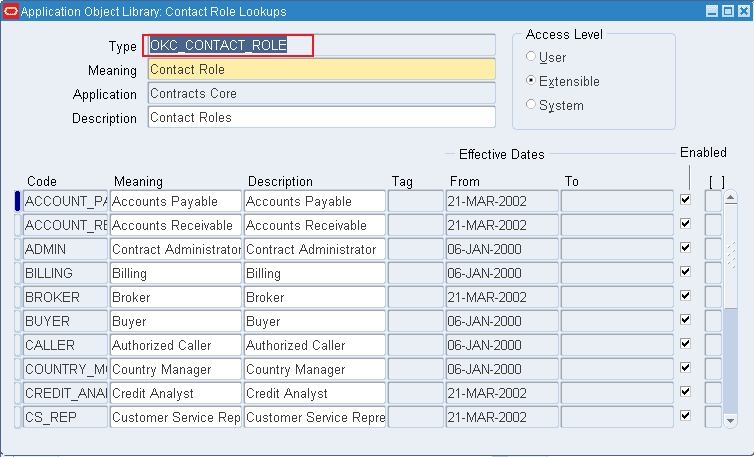 On the other hand Contact roles are related contacts of party/customer associated at header level. Contact roles like Sales Representative, Service Agent etc. 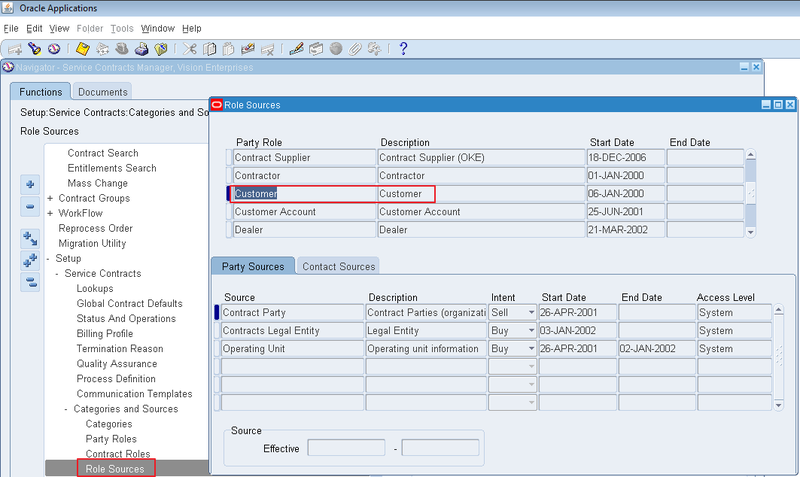 Navigate to Service Contracts Manager -> Setup -> Service Contracts -> Categories and Sources -> Party Roles. Select the New icon (plus sign) from the toolbar to add new party role. Navigate to Service Contracts Manager -> Setup -> Service Contracts -> Categories and Sources -> Contact Roles. Select the New icon (plus sign) from the toolbar to add new contact role. Role sources determine from what source the records will be pulled from system. 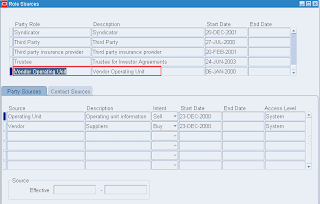 You can modify the source of seeded party or contact roles with the access level User. You can also define the source for new party or contact roles that you set up. You cannot delete a source from a role, after you define it. 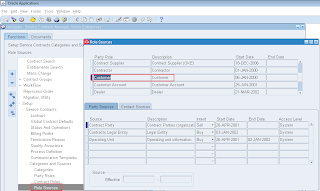 Navigate to Service Contracts Manager -> Setup: Service Contracts -> Categories and Sources -> Role Sources. 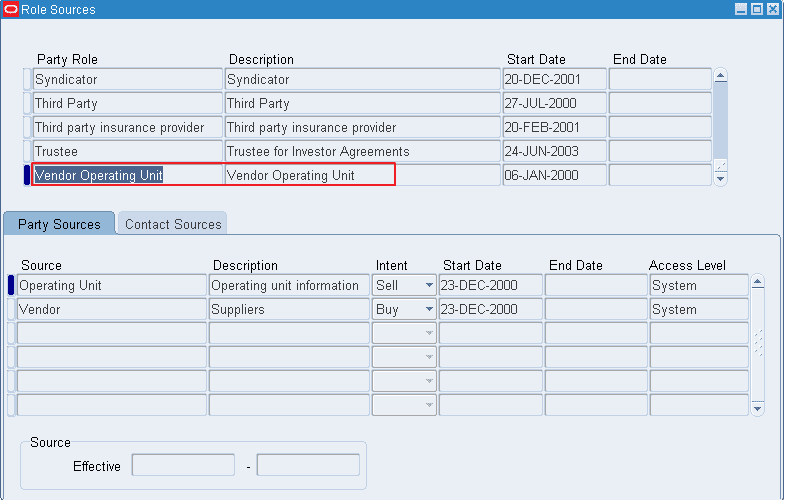 Select a party role for which you want to change role source, like Customer / Vendor Operating Unit. In the Party Source tab, select a source from the Source LOV. Service Contracts are always managed from the perspective of the vendor. We use operating unit as Vendor source. Select Sell from the Intent list as Service Contract is basically a intent type of 'Sell'. Choose a value from the Access LOV. Select the Contact Source tab, and click the New icon (plus sign) in the toolbar. 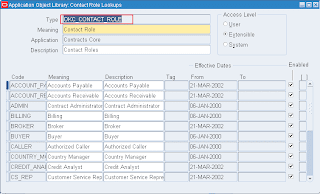 Select a contact role from the LOV. Select Sell from the Intent list. 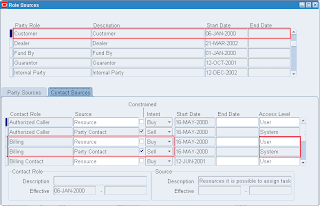 If you are adding a 'Customer' contact role and the Intent is 'Sell', or if you are adding a 'Vendor' contact role and the Intent is 'Buy', check the Constrained check box. 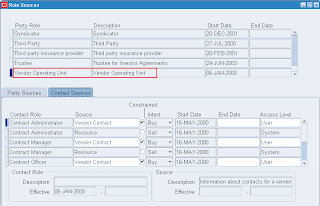 If you are adding a 'Customer' contact role and the Intent is 'Buy', or if you are adding a 'Vendor' contact role and the Intent is 'Sell', do not check the Constrained check box. Select a value from the Access LOV. 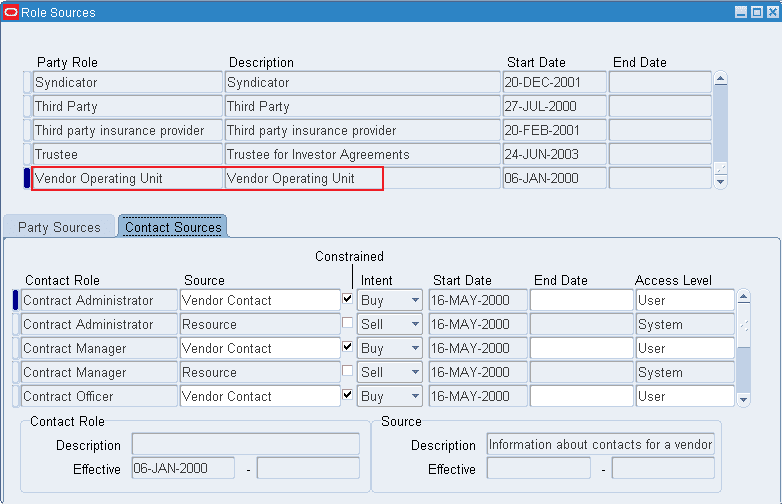 CONSTRAINED checkbox functionality :- In the ROLE SOURCE setup ->CONTACT SOURCE tab, there is a field called CONSTRAINED. According to the user documentation, when this box is UNCHECKED, then any contact from any party is allowed. However, when this box is CHECKED, then only contacts from the indicated party is allowed. 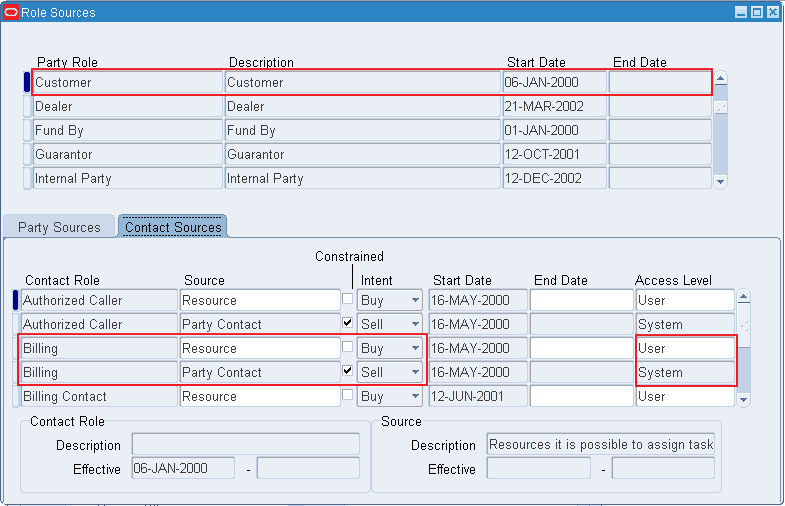 As per bug 2145317, Party Contact And Customer Contact Displays All Contacts In Database, it is reported that the setting for the CONSTRAINED Checkbox determines which contacts appear in the list of values for the party contact. The setting for Constrained in the Party Role definition applies only to Corporate Contracts.